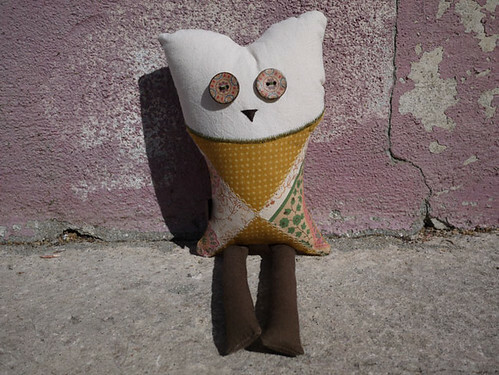 #32 Heart made Owl from Mamima collection, a photo by mamima project on Flickr. We are pleased to HUG you with the #32 doll from Mamima handmade collection. This is the OWL Mamima pattern. This pattern is a limited edition with only one doll. The body is made on fabric and poly filled. One of the fabrics is Chita de Alcobaça a traditional portuguese pattern bought on Armazém dos Linhos in Porto. The nose is embroidered and the eyes are made with coconut buttons. The buttons used for decorating makes this doll unsuitable for young children. Is resistant to kids care and makes a great gift for children and adults.